A few weeks ago, we published a post about the state of Mac gaming, analyzing why macOS gaming has been so anemic. Because Macs are so different from their Windows counterparts, and because the market is so small in comparison, few developers have felt pressure to bring their games to the platform. The lack of robust tools and development support for Mac gaming has also reduced releases, leaving Mac gamers to look longingly over the fence at Windows’ gaming ecosystem. There’s a new kid in town that might change things, however: GeForce Now. 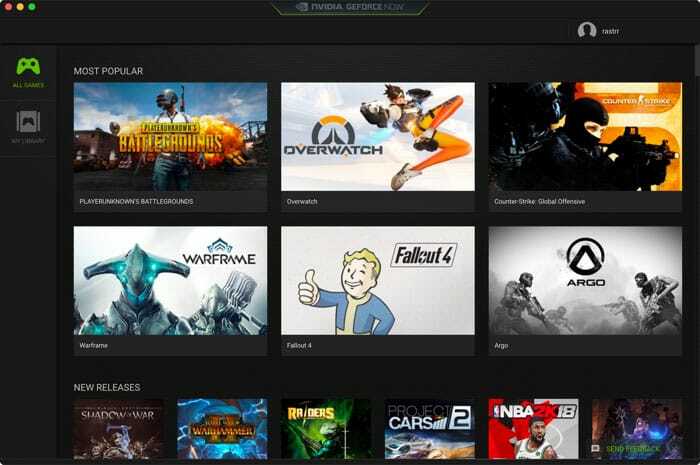 This game streaming platform from graphics card manufacturer Nvidia makes it possible to stream a set of Windows-only games from Nvidia’s powerhouse server farms to your local Mac. Thanks to some serious tech, you don’t even need a particularly powerful computer. If you can stream Netflix, you can stream games, with minimal lag and fairly impressive graphical performance. How does GeForce Now work? GeForce Now is basically a virtualization engine, allowing you to run a games-only instance of Windows on your macOS device. The hardware is based entirely in Nvidia’s server farm, and none of your local hardware is used to render games. Games are not installed on your local drive, and your graphics hardware is not used to render images. You get the benefit of a powerful 1080-class GPU, which renders nearly any GeForce Now-compatible game in excellent fidelity. Only certain games are compatible with GeForce Now, but the list is growing. It includes titles from Blizzard and Steam, including big hits like Overwatch, Player Unknown’s Battlegrounds, Fallout 4, Witcher 3 and CS:GO. You play games out of your own game libraries, so you’ll need to log in to Steam and Battle.net through GeForce Now in order to play games from those platforms. Of course, that means you’ll also need to purchase the games you play. The games are not included in the Geforce Now subscription. Launching a new game creates a new virtual machine instance on the GeForce servers, which you use to interact with the game. You can also take advantage of cloud storage of saved games, with Steam Cloud saves syncing with GeForce Now. The hardware powering that virtual machine handles all the game rendering, saving your (potentially pitiful) local hardware the work. 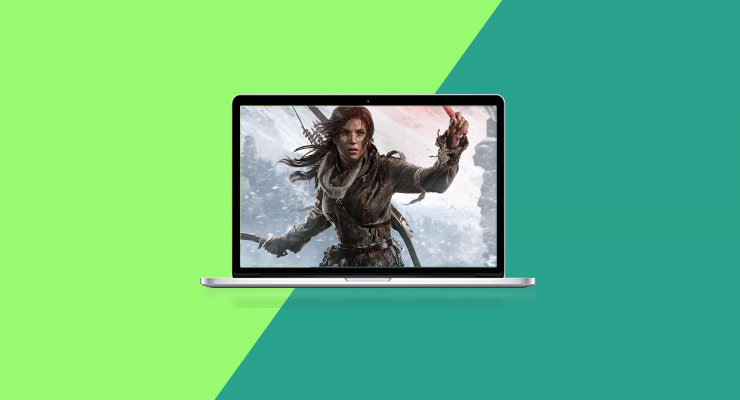 Games are transparently and instantly installed on the GeForce servers, so you don’t need to download files to your Mac. You receive a video stream on your Mac, which is played back through the GeForce Now client. Your mouse and keyboard inputs are sent back over the wire to be processed by Nvidia’s servers. That sounds like it would be disastrous for quick reaction gameplay, but it proved to be acceptably smooth. Play is surprisingly lag free, with very little input lag and an excellent ping on all the multiplayer games we tested (CS:GO, Overwatch and PUBG). Thanks to a distribution of seven server farms throughout the United States, our ping stayed at an exceptional 20ms, with about 40ms roundtrip time on the busiest Northeastern US server. Despite low pin, mouse movement felt subtly “off” at times. While this has improved significantly since earlier versions, there’s still some rubberiness to the controls and rare spikes of input lag. It’s hard not to blame with on streaming, but it’s something you likely wouldn’t notice if you weren’t looking for it, and something PCs are hardly immune from. Frame rate proved to be excellent, with the hardware pinning playback at 60 frames per seconds in all the games we cared to try. This is to be expected, with the graphical power behind the setup. When compared to gaming on a local Windows machine, there are some downsides. Play isn’t as smooth, and its hard to tell if movement and lag spikes are a normal part of online play or caused by streaming issues. While there’s a good collection of servers available in the US, gamers in other regions are out of luck for the time being. In testing, we also found that some games don’t look great on a Retina screen. Because games are streamed in HD resolution, that needs to be stretched to cover the entirety of a MacBook Pro’s Retina screen. While the graphics rendering quality is still excellent, the aliasing proved to be surprisingly distracting. It’s especially noticeable in games like Overwatch, with tightly-edited visuals that seem to exaggerate aliasing issues. Less polished games like PUBG suffer from a similar issue, but it was far harder to notice without making serious inspection of on-screen text. Changing resolution in games that support that has no noticeable impact on this issue. Considering the rendering resources required to put together polygons at Retina resolution, it’s likely to stay this way for now. Even a locally-available 1080 Ti can’t reliably render a full MacBook Pro’s worth of pixels at a rock-solid frame rate in every game. Some weird bugs also cropped up, but that’s nothing out of the ordinary for beta software. The dev team is responsive to feedback in forums, and problems get addressed and fixed quickly. We also found out that the 2017 MacBook Pro’s keyboard is a poor substitute for the mechanical keyboard we normally play with. We can unabashedly say that this fulfilling one of our long-time dreams to see gaming grow on the Mac. Even in its current form, GeForce Now is an awesome platform. Better still, the Mac service is free while it’s in beta. It’s a fairly impressive technical accomplishment, with amazingly little variation from purely local play. The coolness of playing real games on my MacBook Pro is something that’s left me a little starstruck. No pricing information has been formally announced, but we can probably expect a monthly fee between $10 and $25 per month when the service is formally launched. Will it be worth that much when it launches? We’ll have to judge it on its merits then, but for free ninety-nine, it’s amazing. If you want to check it out, go for it! Just make sure to get a decent mouse first. Gaming on a trackpad is nightmarish.